I love those shoes! I guess I've seen enough high heals on royals for a long time. Not a bad outfit but a little to dull, it needs color. This is a lovely coat that stands the passing of time, I remember it from 2005, I like the fact that it's reversible and you can see a little camel peeking out, however I do not like the effect of this coat with the length of the pants, it shortens the body and it just doesn't work for me. I am glad that she is not wearing stilettos, I know that it's trendy to do so with culottes, but I can't love it. This is a total miss for me. I do not care for the chunky heels or the shorter pants. The jacket length with the shorter pants just makes it all worse. 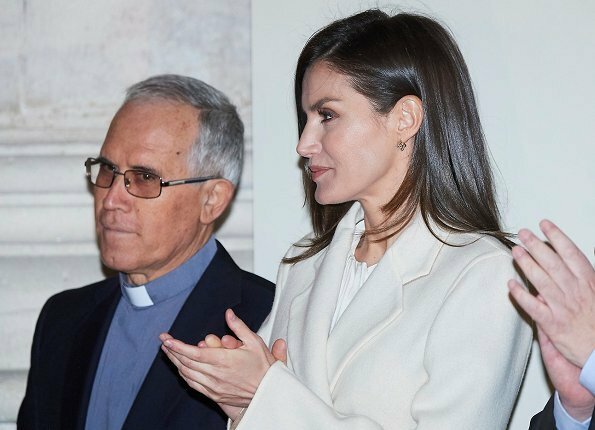 Letizia is usually great, but today was not one of those times. Totally agree with you. The short length trousers are just about okay with a short jacket but look awful with the coat. 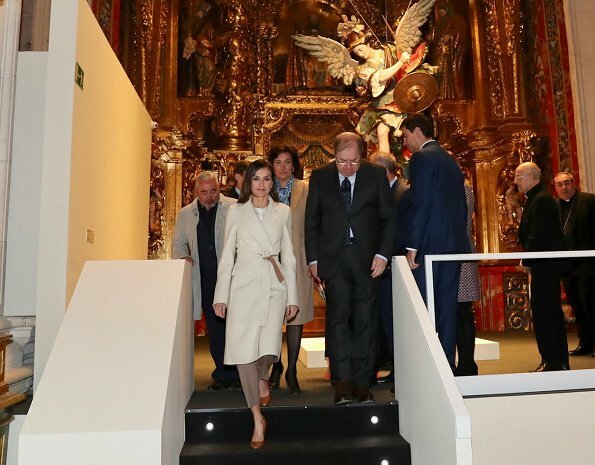 I didn't like the shoes much when Letizia wore them last week but again they were okay --just-- with the overall outfit. Today they look clumsy. 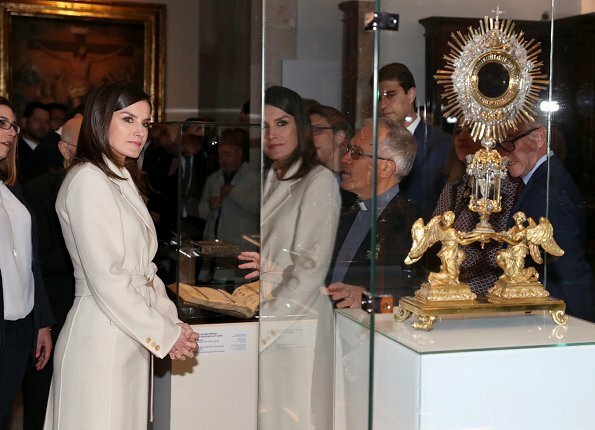 Not one of Letizia 's better outfits in my opinion. I do like the coat. Count me in as well. This look is a miss for me as well, and largely due to the length of the trousers. There is a fine difference between trousers looking like they are supposed to be that length, and looking like they are far too short. That difference is defined by how and with what they are combined with to create a look and here for me this is a fail. The coat by itself is actually quite charming and beautiful with the reversible colours, but the overall look of the whole ensemble is a thumbs down for me. OMG! The little blue shoes of that baby are too cute for words. The outfit looks tasteful and appropriate. It takes a bit of sophistication to move away from the first 4 colours we are introduced to. The thick heels are necessary as the ground is cobbled. RL's fashion transcends borders. Here is someone else wearing an identical outfit in a colour that some did not like. http://www.maroc.ma/en/princely-activities/ Lalla Hasnaa is wearing..... to open an art exhibition in Paris. I think she looks just spectacular in this outfit. Especially nice is the crisp tailoring of both the coat and trousers, the very neat and classical lines, and her shining hair. 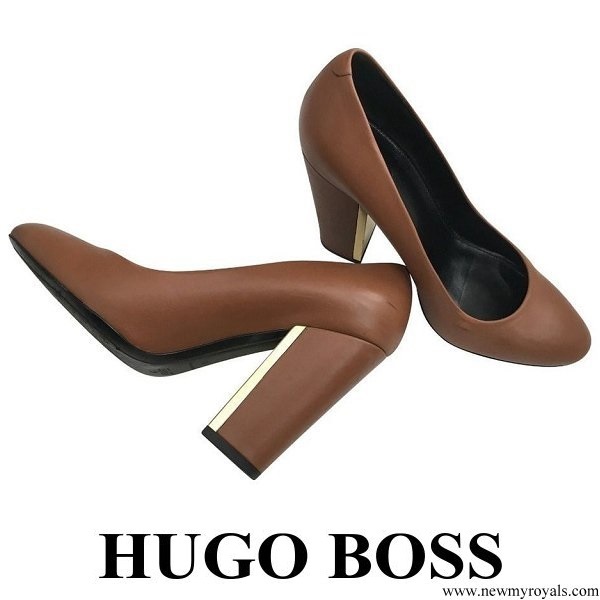 Those shoes are perfect for the cobbled pavement and blending of the caramel-white shades. 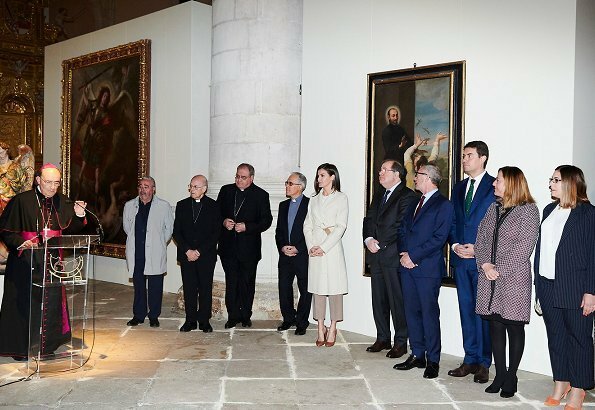 I agree , and in Burgos it is cold so she needed a coat. pants?? they are quite nice, I would love having the same. This outfit is amazingly luxurious looking. The different shades of neutrals make it a super hit. 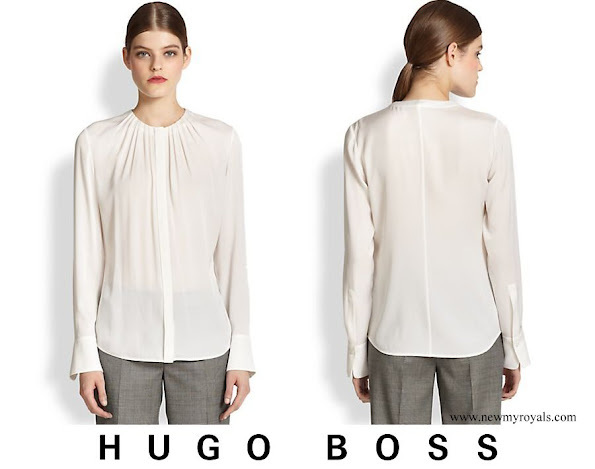 By now we should be able to analyze that Hugo Boss gives her a perfect fit in their ready to wear items. At many of her events other influential Madrid women wear some of the same items that we have seen her with. Most recently the blue checked jacket worn in Mexico. Perhaps they too should be outed? 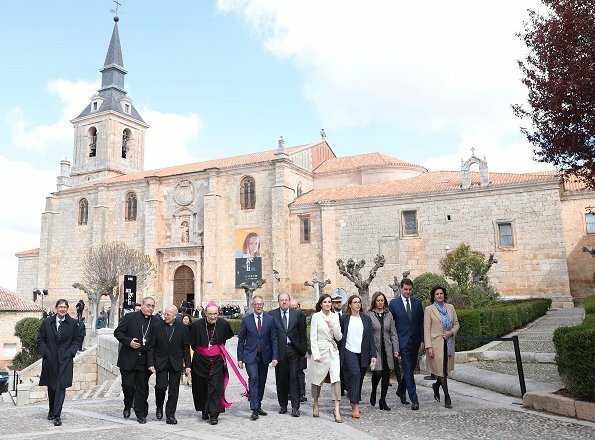 Fantastic town Lerma and Burgos province!!! History and heritage!! Se llevan mucho estos pantalones pero al ser de pata ancha hacen un efecto extraño sobre todo si los pones co abrigo. Todo por separado me gusta. El juego de colores tambien. I love the shoes. Her simple looks do not impress me. I would like to see more bling. The best part of her look is when her husband is by her side.